On the evening of October 27th, multi-platinum rock band, AVENGED SEVENFOLD, will give a global, 3D/360-degree, live-streamed virtual reality performance in partnership with Universal Music Group (UMG), the world leader in music-based entertainment, Capitol Records and VRLIVE. Fans around the world will be able to view the live stream on UMG’s newly released VRTGO VR platform, powered by VRLIVE’s advanced technology, and experience AVENGED SEVENFOLD’s electrifying set as if they were there for this first-of-its-kind immersive event. VRTGO is freely available on iOS and Android. AVENGED SEVENFOLD made headlines with last week’s release of “The Stage”, a new track co-produced by the band and Joe Barresi and a companion video directed by Chris Hopewell. The latter has already amassed well over six million YouTube views - watch it on KNAC.COM right HERE. On December 2nd, Warner Bros. will release a best-of compilation package of AVENGED SEVENFOLD's biggest Warner Bros. hits to date. 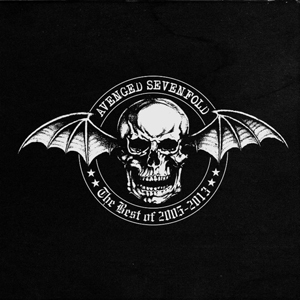 The two-disc set, titled The Best Of 2005-2013, features 18 songs from AVENGED SEVENFOLD's best-selling Warner Bros. albums released between 2005 and 2013 including City Of Evil, Avenged Sevenfold, Nightmare and Hail To The King. The package also features a cover of black sabbath's "Paranoid", originally on the Warner Bros. tribute album Covered, A Revolution In Sound as well as two original songs that AVENGED SEVENFOLD wrote for video games: "Carry On" (Call Of Duty II) and "Not Ready To Die" (Call Of The Dead). The album will be available at all physical and digital retailers on December 2nd.